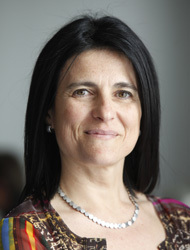 Amparo Acker-Palmer is professor of molecular and cellular neurobiology at Goethe University in Frankfurt and professor in the "Focus Program Translational Neurosciences" (FTN) at JGU. She is also one of the leading researchers of the recently established Rhine-Main Neuroscience Network (rmn2). Since 2009, she has been a member of the Board of Directors of the Cluster of Excellence "Macromolecular Complexes". In 2010, she received the Paul Ehrlich and Ludwig Darmstaedter Award for Young Researchers, which is granted to young scientists for outstanding achievements in the area of biomedical research in Germany. Press release "Blood vessels instruct brain development"
Press release "German Research Foundation extends funding for basic research in the neurosciences"
Press release "How do neurons and blood vessels talk to each other?" Press release "German Research Foundation funds new Collaborative Research Center at the Mainz University Medical Center"
Press release: "Gutenberg Research College welcomes new fellows and bestows the Gutenberg Research Award"